June 25, 2015, King of Prussia, PA – MidAtlantic Employers’ Association (MEA) announced the results from the 2015/16 National and Regional Policies and Benefits Survey containing information from 1,906 participating organizations across the United States including the MidAtlantic region. The survey is conducted every two years by the Employer Associations of America (EAA) which consists of 34 regional employer associations that serve 48,000 employers. 88% of the respondents have an employment size of 500 or less employees with 48.6% in the Manufacturing industry and 47.3% in combined Services Industries making it one of the most comprehensive sources of data on policies and benefit practices of small to mid-sized employers. Costs: Benefits cost on average about 32% of payroll which is consistent with prior surveys. Part-time employees: Nationally, the percentage of employers providing medical and dental insurance to part-time employees dropped from 51% – 55% down to 27% – 32% which is no doubt impacted by changes brought on by the Affordable Care Act. Moreover, in the 2013/14 survey approximately 75% of employers offering part-time medical insurance provided the same as full-time or pro-rated. This percentage dropped down to 49% – 52% in the 2015/16 survey. Medical Plans: Regionally, PPOs continue to be the most popular medical plan followed by High Deductible Health Plans which are offered by approximately 41-42% for non-union employers. 23% of employers offer some type of HMO. Nationally, 32% of employers offer Health Savings Accounts and 14% offer Health Reimbursement Accounts. Regionally, 28% offer HSAs and 29% offer HRAs. Premiums: The average employer share of premiums for a single insured in the region are 77% for HMOs and 75% for PPOs while the percentages drop to 67% for family coverage for both HMOs and PPOs. Self Insurance: Nationally, approximately 36% of employers with 100 – 500 employees self insure their medical coverage. The percentage of employers with more than 500 employees that self insure climbs to 63%. Co-Pays: Average co-pays for HMOs nationally are $23 (regular) and $36 (specialist) and for PPOs are $25 (regular) and $38 (specialist). Wellness Incentives: Nationally, 33% of employers offer wellness incentives with 63% of those offering some type of premium reduction as an incentive. Domestic Partner Benefits: Participants offering domestic partner benefits increased nationally to 38% up from 32% in 2013/14 and 26% in 2011/12. Nationally, 95% of employers offer dental coverage while 77% offer vision insurance. Regionally, the figures rise to 97% and 93%, respectively. Nationally, 95% of employers provide life insurance with 95% paying the full premium. 87% of employers provide Accidental Death and Disability and 80% provide Short-Term Disability insurance. Self Directed Plans (401(k)/403(b)/457) continue to be the most popular form of retirement plans. Nationally, 93% of non-union employers offer self directed plans with 40% providing vesting immediately or within the first month. Regionally, 91% offer similar plans but only 27% provide vesting immediately or within one month. Salary: Job based compensation plans are still the most popular with market pricing (41% nationally and 33% regionally) and job evaluation systems (13% nationally and 15% regionally) the most common. Person based plans such as skill based pay and competency based pay are found in approximately 23% of survey participants nationally. Incentive Compensation: Nationally, incentive plans continue to be popular plans with the top five programs being organization based discretionary bonus (27%), individual incentives (23%), company level goals bonuses (19%), spot awards and profit sharing (both found in 16%) of organizations. Performance Appraisal: Nationally, approximately 44% of organizations link pay decisions to individual performance appraisals while 35% said performance appraisals were indirectly linked to pay decisions. Casual Work Attire: Regionally, the vast majority of employers allow for business casual or casual dress days with 3-4 days per week as the norm. Flexible Schedule: 18 – 21% of employers allow for flextime work schedules throughout the year. For management, supervisory and professionals, 23% of regional employers permit telecommuting and 34% have part-time workers while 47% do not allow for any alternative work schedules. Internet and Mail Usage: Regionally, between 57% – 59% of employers place some type of restriction on internet access although 76% permit internet and personal email usage during work hours and 61% permit instant messaging for non-production personnel (50-53% for production). For non-union employers, 60% – 65% permit access to social networking sites during work hours. 38% – 46% of employers monitor internet usage. Personal Technology: Depending on the role, 65% -85% of employers in the region cover cellphone costs and 25% – 44% cover the costs of an iPad. Tuition Reimbursement: Regionally, over 75% of employers offer some form of tuition reimbursement with over 92% of the cost covered if all the conditions are met. Yet, only 5% – 10% of employees take advantage of tuition reimbursement. Recruiting Costs: For regional employers using outside recruiters the average fee is 18% – 20% of the first year compensation. The Employer Associations of America (EAA) consists of 34 regional employers associations that serve 48,000 employers with more than six million employees. The EAA’s mission is to advance a national presence and to promote local success among members through unparalleled collaboration, excellence and efficiency. To learn more about EAA and its member employer associations, visit www.eaahub.org. MidAtlantic Employers’ Association (MEA) is dedicated to helping growing businesses to stay current and compliant and to attract, develop, motivate and retain their workforce by providing employers with a complete array of HR tools, services and support. Members of MEA have access to more than 13 annual and bi-annual surveys on salaries, benefits and other HR practices which allows them to stay current, simplify the gathering of market data and save money. 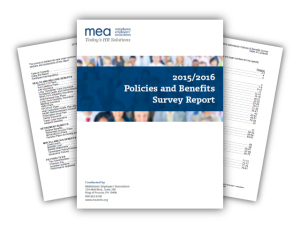 To purchase the report or learn more, email surveys@meainfo.org or call 800-662-6238.